Large scale collage billboard project made for the Capture Photography Festival, curated by Jayne Wilkinson. April 3 through 30, 2019 (Vancouver). 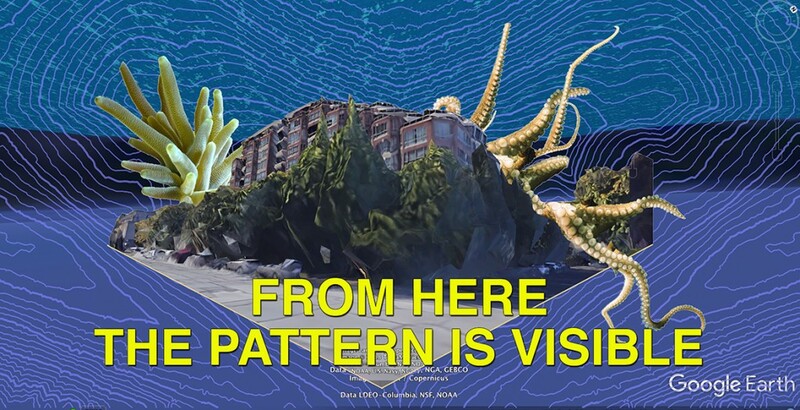 the view from here is a series of large-scale billboards that consider strategies for imagining a future where we might better sense the digital infrastructure and global networks made invisible by the surface of the sea. Incorporating images from Google Earth taken from the very sites in which the works are installed, the series simultaneously collapses the constructed view of the image while also placing viewers within it. Speaking directly to passersby through a series of prompts, the work encourages a collective visualization of how the view from here might one day be different. 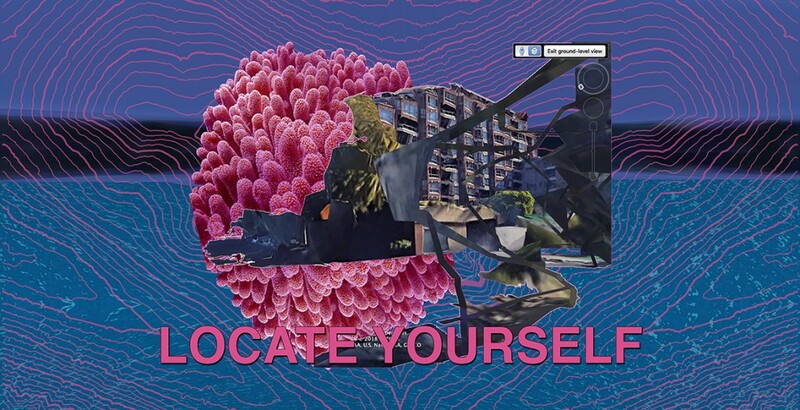 Christina Battle’s images are the most directly related to their installation sites, demarcating a presence and immediacy connected to the oceanic and digital economies that serve Vancouver. In this new commission, the view from here (2019), Battle asks viewers and passers-by to consider how the digital infrastructure and global networks are obscured by the surfaces of the sea. Even as ships fill the harbour and fibre-optic cables line the ocean floor, it is easy to ignore these economies in favour of the ocean’s romance. Combining Google Earth–sourced imagery from the specific sites in which they are installed, contour lines suggesting various underwater depths, and lifeforms from an alien world, Battle creates a kind of feedback loop of visual regimes. The Twitterlength poetic texts prompt viewers to ask how they sense, feel, and understand proximity, encouraging a collective visualization of how the view from here might one day be different. As complex image composites produced with satellite imaging and mapping technologies, they remind us that the sea is literally a medium for sending and receiving signals and that it teems with contradictory messages. 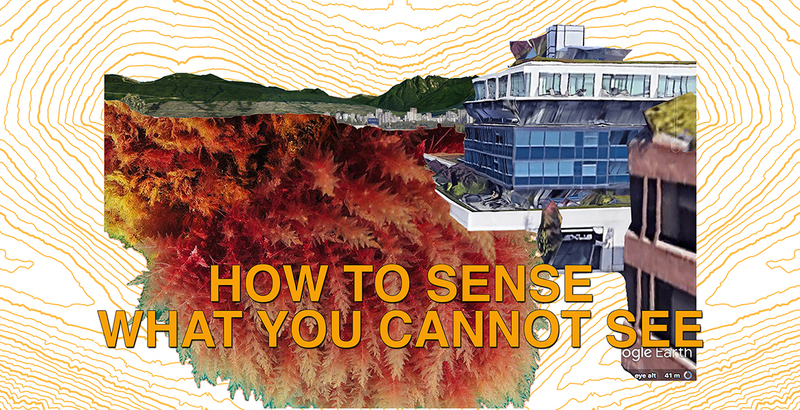 Environmental art historian T. J. Demos points out that in the visual culture of the Anthropocene (our current, human-defined geological epoch), a notable shift has occurred from photography to high-resolution satellite imagery and remote-sensing technology, scaled to global, even interplanetary measurement. Today, photography consists primarily of images that are automatic and constructed, not mimetic and indexical—Battle’s collages tread in this terrain. Representation does not take the form of a single image, but is instead situated somewhere in the littoral space of an urban shore, within a technosphere that extends from the deepest parts of the ocean to the highest paths of atmospheric satellites.